First and Second Class (2010-2011) applied to take part in a CRAFTed programme. This initiative gives primary school children and teachers an exciting opportunity to explore their creativity and learn new skills by working collaboratively with professional craftspeople. We were delighted to be accepted onto the programme and started to plan our ceramic project with artist Gráinne Callery. Gráinne and her husband Tom have their own pottery studio called Breeogue Pottery. We looked at our locality for ideas and focused on Carrowmore Megalithic Tombs. We decided to use megalithic tombs and art as the inspiration for our project. We visited Carrowmore Tombs and we also researched Newgrange and the Turoe Stone in Galway. The largest tomb in Carrowmore is called Listoghil. It is covered by a huge four metre cairn, people were cremated and buried in this tomb. There are inscriptions on one of the stones, this is the only passage tomb art that is in Carrowmore. The people used flint stones to write on the stones. We did some rubbings of the inscriptions. We found out all about what life was like for the people that lived there six thousand years ago. They ate a lot of fish, cattle and berries. The people made clay pots and bowls which were preserved in the ground for thousands of years and are on display in Carrowmore Visitors Centre today. We started to plan our project and decided to make individual clay coil pots. We did this by making five sausages out of clay and rolled each one evenly. We put newspaper inside our bowls to help shape the clay. Then we smoothed down the inside of our pots with the back of a spoon. These were then left to dry, put into a kiln, glazed and put into a kiln again for a second time. For the second part of our project we decided to make eight stone like structures out of clay to be arranged in a circle incorporating megalithic art. We also agreed to create holes in our structures and possibly put a light inside (the use of light in Newgrange gave us this idea)! Gráinne helped us to create our base and then we rolled clay coils into spiral shapes. We made hundreds of these between us! 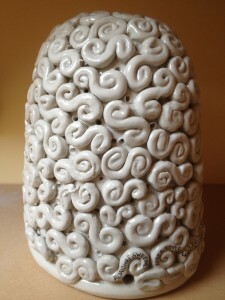 Then we painted the base with slip (watered down clay) and pressed our spirals down gently onto our base. We then pierced holes into our sculptures with paintbrushes. 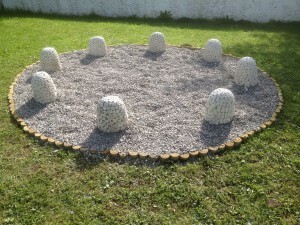 Our sculptures dried out and Gráinne put them into a kiln and we visited her pottery studio Breeogue to glaze them. They were then placed into the kiln again for a second time. We were delighted to see how working collaboratively we made these beautiful pieces of art which incorporate the wonderful megalithic tombs which are located in close proximity to our school. We would like to thank Gráinne for all her hard work and dedication to this project. Our ceramic art is now on display outside our school and we hope you enjoy it! When the school embarked on the construction of our new school extension in 2014, this ceramic art installation was unfortunately situated on the site of the proposed new building. This necessitated in the removal of the installation which was placed in storage until the completion of the building project. During discussions on the new building, a site in the enclosed courtyard was earmarked for the ceramic installation. 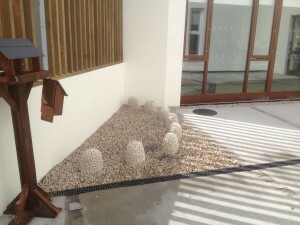 When the building was completed, the installation was re-located to its new position in a sunny corner of the courtyard between The Glen and the senior infant classroom.